TALLADEGA, Ala. – Taking control in the final three laps of Sunday’s wreck-filled GEICO 500 at Talladega Superspeedway, Brad Keselowski claimed his fourth NASCAR Sprint Cup Series victory at the 2.66-mile race track and solidified his spot in the Chase for the NASCAR Sprint Cup. Choosing the top lane for a restart on Lap 186 of 188, Keselowski powered his No. 2 Team Penske Ford past Kurt Busch with two laps left and crossed the finish line as a gaggle of cars wrecked behind him coming to the stripe. 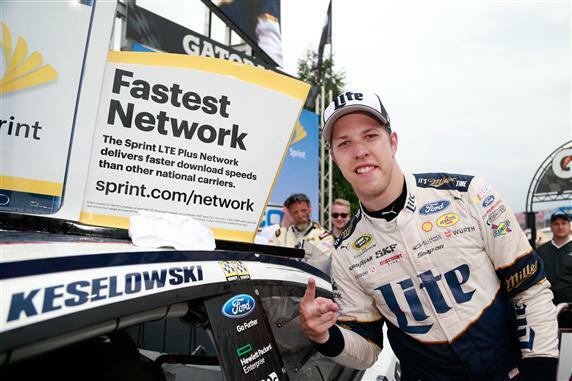 “The last three or four restarts before that, the high lane had went, and as the leader a lot of it is out of your control,” Keselowski said in Victory Lane. “You need the cars behind you to push and a couple of them they did and a couple they didn’t. That’s just part of racing, and there was nobody at fault with that. In claiming the 19th victory of his career, Keselowski became the fourth two-time winner in the Sprint Cup series this season. The race ended under caution, with Kyle Busch in second place and Austin Dillon bringing his battered No. 3 Chevrolet home in third as the survivor of two early crashes. McMurray ran fourth, one spot ahead of polesitter Chase Elliott, who worked his way up from ninth to fifth after the final restart. Ty Dillon finished sixth after taking over for Tony Stewart under the first caution on Lap 51, a move that proved wise given the combination Stewart’s recent recovery from a broken back and the chaos that followed late in the race. Clint Bowyer was seventh—his best result so far this year—and Kurt Busch was shuffled back to eighth on the final lap. With drivers jockeying for position and making risky moves throughout the race—with a sense of urgency exacerbated by the threat of rain that never came—Sunday’s event featured 10 cautions and more torn-up race cars than one can count on a full complement of fingers and toes. There wasn’t just one “Big One.” There were three massive wrecks at Talladega on Sunday, with one melee on Lap 161 involving 21 cars, more than half the field. Kurt Busch ignited that accident by tapping Jimmie Johnson’s bumper in the wrong place, turning Johnson’s No. 48 Chevrolet into Paul Menard’s Chevy and triggering a wreck that ended with chassis strewn across the racing surface and on the infield grass. On Lap 181, a 12-car chain-reaction incident took out hard-luck Matt Kenseth, who had led 39 laps, second only to Keselowski’s 46. Earlier, on Lap 96, Chris Buescher’s No. 34 Ford took the brunt of a seven-car crash that ended with Buescher barrel-rolling three times after contact from Michael Annett’s Chevrolet. “I thought we were clear of the wreck,” Buescher said after leaving the infield care center. “I saw it happening in front of us and checked up, and the next thing I knew I was upside down. By the time Buescher flipped, Dale Earnhardt Jr.’s winning chance already had evaporated. Fighting a loose handling condition in heavy traffic, Earnhardt lost control of his No. 88 Chevrolet on Lap 50 and wiped out Hendrick Motorsports teammate Kasey Kahne. Earnhardt returned to the race only to be ridden into the Turn 1 wall when Carl Edwards’ damaged Toyota blew a right front tire and shot up the track into Earnhardt’s path. That was a two-car incident, a small one relative to the multicar crashes that followed in the second half of the race, which, in true restrictor-plate racing fashion, produced 37 lead changes among 17 drivers. Keselowski might argue that point, because pushes from both McMurray and Busch got him to the front when it counted most.